Tomorrow (Thursday, March 21), the Conference of Presidents (= political group leaders) of the European Parliament will set the schedule for next week's Strasbourg plenary session, with the plenary debate on the Directive on Copyright in the Digital Single Market ("EU Copyright Directive") most likely to take place on Tuesday (March 26) and the vote later that day or the next day. In light of various developments, most notably a position paper by the Christian Democratic Union (CDU) of Germany (= Merkel's party) on the subsequent transposition of the EU directive into German law, I'm convinced the best and smartest thing to do for the Parliament, its largest parties and even for the EU as a whole would be to postpone the vote into the next legislative term. Certain discontinuity effects would be felt, with hundreds of new MEPs on board, but even the burdensome implications of a postponement would be preferable over a situation in which the important final two months of this year's EU election campaign would be overshadowed by public outrage over a rubberstamping of, above all, the ill-conceived Article 13. But normally the vote will take place next week, and then the best thing to do would be for a majority of MEPs to vote to delete Article 13 so the process can continue. In fact, the EU Council (where the governments of the Member States cast their votes) could adopt the bill without Article 13. A new legislative process for Article 13 would be warranted. It's not just "one little article." Even by the narrowest definition, we're talking about 1,200 English words, making it almost as long as the Declaration of Independence--but if you include the directly-related Article 2 and, especially, the Article-13-specific recitals 37 and 38, the total length is at a level with the original (prior to amendments) U.S. Constitution. I drew those comparisons at a first and small-scale press conference yesterday ahead of a demonstration that will take place on Saturday. Thankfully, the chairman of the Digital Agenda Committee of the German Bundestag (Federal Parliament), Jimmy Schulz, provided an introductory overview of the issues yesterday and will also speak at our demonstration. Jimmy, a member of the libertarian Free Democratic Party (FDP) and an IT entrepreneur, already was a tremendous ally on software patents (years before he was elected for the first time), so I've known him for about 15 years; later he also sponsored and authored a resolution against software patents that the Bundestag unanimously adopted in 2013. While a non-legislative resolution doesn't change the law, it was an important signal that the European Patent Office unfortunately ignored. A bigger press conference will take place on Saturday at 11 AM local time, and the demonstration will start at 1:30 PM on Marienplatz, Munich's central and most famous square. We'll walk through some inner-city streets and reach our final rally point, Odeonsplatz, around 3 PM. I'll be one of the speakers at the final rally and I'll tell participants about a few things they can still do in the final days before the vote to influence the outcome. In order to be able to focus on a call to action, I asked to be the final or penultimate speaker. The main event on that day will actually be the Berlin demonstration. But Munich is also strategically important as it's the capital of the only state in which the Christian Social Union (CSU), the CDU's Bavarian sister party, is running--and a CSU politician, Manfred Weber, is the European People's Party's spitzenkandidat (yes, they adopted that German word Europe-wide many years ago) and aspiring to succeed Jean-Claude Juncker as president of the European Commission. While the Wikimedia Foundation isn't involved in our street protests, the German Wikipedia community (which must not be confused for the foundation!) 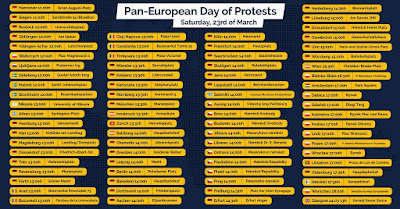 recently voted to let Wikipedia.de go dark all day on Thursday (March 21) in the sense of blocking access to its content, showing only an information page that calls on Wikipedia users to contact their MEPs. I wish to distance myself from the insults ("go f*ck ***") and violent fantasies ("stuff your mouth with your necktie") in it. Before Mr. Voss became the anti-Article 13 movement's lightning rod (by the way, it's absolutely outrageous that someone made a bomb threat on Reddit), I was actually the number one shitstorm victim among those advocating strong copyright enforcement. In 2012, I went through a couple of shitstorms because of the district court's fundamentally flawed decisions, which the Federal Circuit reversed in two separate appeals just as I predicted (copyrightability in 2014, fair use in 2018). That's why I have more sympathy for his situation than many others, and it's not that his quest for stronger copyright enforcement is illegitimate: it's that his proposal overshoots and will cause massive collateral damage to 21st-century forms of creativity such as memes, fan fiction, and forms of commentary enabled by digital technologies (such as videos with overlay commentary), all of which would benefit from a U.S.-style fair use exception. The reason for which I wanted to show the video regardless of the ways in which it steps over the line is that some people have put a lot of effort into it and it's been viewed more than a million times. The rap song repeatedly calls on listeners to take to the streets on 3/23 (= this week's Saturday). It's hard to predict how many people will actually take to the streets on Saturday. At one recent demonstration, only three dozen people expressed their intent to join on the related Facebook page, but more than 1,000 showed up. In order for the demonstrations to have an impact, the aggregate number will have to be well above 100,000 in my view. 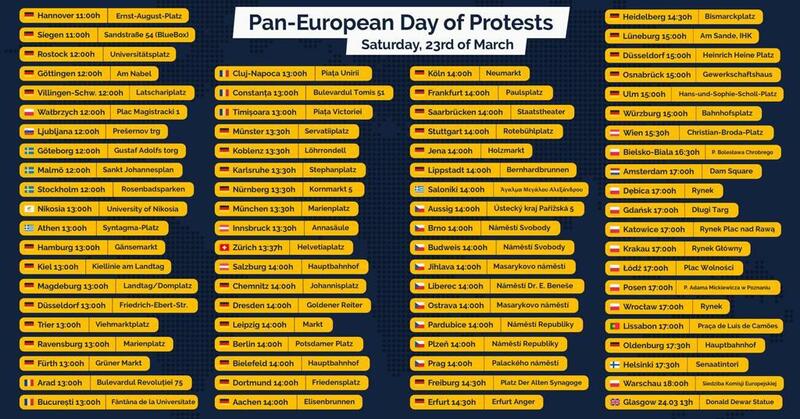 For Munich I'm sure we'll be at least a few thousand, and I hope more than 5K. Should Article 13 be adopted the CDU and CSU's candidates will likely face such backlash at virtually every campaign event--and especially on the Internet. They should go back to the drawing board with respect to Article 13, be it by postponing the vote or by a majority of MEPs voting to delete the article, in which case the ball will be in the EU Council's court (they could still bring back Article 13, and at the second-reading stage the hurdle for deletion is higher as a majority of MEPs will be required, with absentees having the same effect as a vote for the Council's position). I rarely participate in street protests. I went to a few anti-software-patent demonstrations in 2004 and 2005 (including a couple of rally speeches), and reported on one or two Munich demonstrations organized by SUEPO (Staff Union of the European Patent Office). But I deeply care about this copyright matter--and I'm actually a staunchly pro-copyright blogger and have generated income from copyrighted works since my high-school days when I wrote computer books and articles for computer magazines.